If you’ve ever tried to take the bowl away from your pup while he’s still eating from it and nearly lost your hand…that’s a food aggressive dog. In this post we are going to deal specifically with resource guarding food, but if you want more information about how to stop resource guarding, this article “Resource Guarding in Dogs” is very informative. Never, ever, ever punish your dog, because this behaviour is not his fault. Don’t try and wrestle the food or bowl away from your dog. 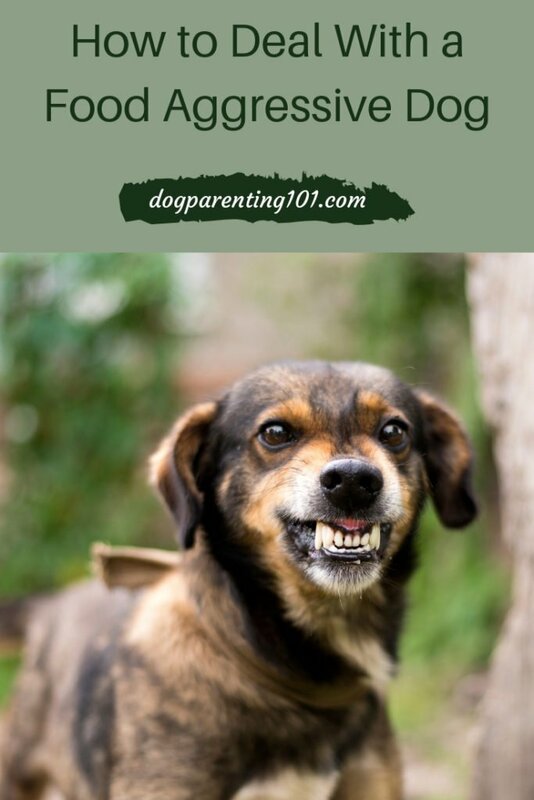 Below you will find two different step by step methods to help your food aggressive dog. I have always fed all my dogs on a schedule, and it never fails – there’s always one dog whose clock goes off a few minutes before and they’re on high alert! Guarding has never been a problem in my household, but for a dog who guards his food that is a problem because his anxiety is already starting to build in anticipation of what always happens. For that reason, try varying feeding times a bit so he never quite knows when it’s coming. Feed him from a new bowl in a different location so it breaks the pattern, and cycle, of his anxiety. You want nothing but positive associations at meal time, for your dog to know he gets delicious treats when you approach his bowl, and he never has to worry that anything is being taken away. IMPORTANT NOTE BEFORE WE START – I am going on the assumption you are feeding your dog two set meals a day rather than free feeding (leaving food out for him all day). If you aren’t, now is the time to start. It is a much better way for your dog to eat anyway, rather than allowing him to graze all day long. If you have to get him used to eating set meals, start with that first then do the training. Feed him once in the morning, and once in the late afternoon. Show him the food, leave it down for 15-20 minutes, then pick it up. If he didn’t eat, try again during the next scheduled time. It may take a couple of days, but your dog won’t let himself starve. If you’re having serious problems with him eating, consult your vet to make sure he’s feeling okay. Let’s get started with the training!! Pick up your dog’s empty bowl, make it look like you’re filling it with food, then put it on the floor. When he looks at you with that “what’s with the empty bowl look” praise him and give him a bit of food. Once he’s finished and looks at you again, add a little more. Repeat this until his portion for that meal has been eaten. Walk away, then come right back and add just a bit more. You want your dog to see that good things happen when you approach. Feed him each meal this way for about a week (longer if necessary depending on the severity of his guarding behaviour), and as he becomes more and more comfortable with you being so close to his bowl, you’ll add more and more food each time, until you can put down a full bowl of food and he will eat it with you standing next to him. Walk by his empty bowl and throw a high value treat in. 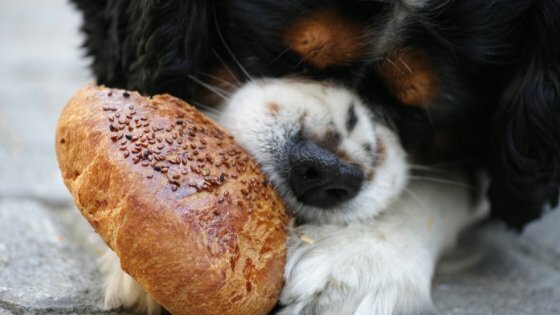 A high value treat is something your dog loves, but doesn’t usually get. It could be chicken, ham, liver, hot dogs, cheese… Do that several times over the course of a week or so. Again, you want to show your dog that good things happen when you approach. Throw that high value treat in his bowl while he’s in the middle of eating a meal. He should be relaxed enough to eat with you near him. If at any point he seems stressed or shows that guarding behaviour again, you may have moved too quickly. Back up to the point where he was still relaxed, and progress a little slower. While your dog is eating, keep your distance so he’s not in guarding mode. In a fun tone say something like “what’s that?” or “what are you eating?” or whatever sentence you choose, then throw a high value treat into his bowl. Hopefully the distance you need to be for him to be comfortable and your throwing arm are compatible!! Don’t worry if it misses the bowl sometimes, he’ll find it so don’t you go get it. Do this a few times throughout the meal. Keep the pieces small, but not too small that he can’t enjoy what you’re giving him. 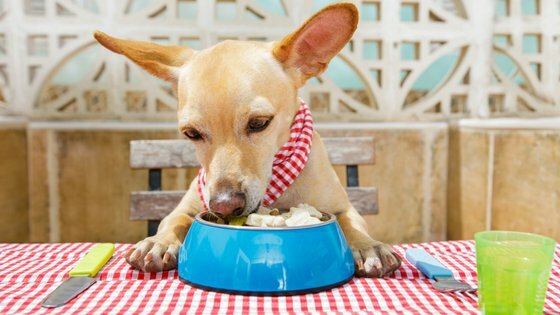 Keep this up each time your dog eats, and do not move on to step 2 until your dog has been relaxed eating in this manner for one week (14 meals). If at any point he’s exhibiting, or about to exhibit guarding behaviour, you may be standing too close so take a step or two back, and just carry on. It’s entirely possible that at some points during this exercise, your dog will leave his food and come to you looking for treats. It’s a good sign but ignore him. He only gets the treat when he’s at his bowl eating. Your dog has been relaxed with you tossing treats into his bowl, and you’re both ready for the next step. You’re doing pretty much the same thing as you’ve been doing – asking him what he has there and tossing him a treat, only this time you are taking one step forward, tossing him the treat, then taking one step back. In step 1 you remained in place when giving him treats, now you are taking one step forward, throwing it, then stepping back. Repeat this several times throughout his meal. Every day take one very small step closer. If at any point your dog is starting to show guarding behaviour, you may have progressed too quickly. Go back to the distance he was comfortable, and perhaps rather than taking a step closer every day, try every other day. You want to be within about two feet of him for about a week before you move on to the next step. By this point you should be able to ask him again what he has there, walk up to the bowl, drop a treat in then walk away. Don’t stare at your dog, be cool just walk over and do it. Do this for a week of meals, then you can move on. By this point your dog should be ready to take a treat from your hand, so let’s see how we accomplish that! While your dog is eating, and saying that same sentence you decided on in step 1, take a treat in your hand, walk right next to your dog, bend over ever so slightly and encourage him to eat the treat from your hand. Once he does just turn around and walk away. You know the drill, repeat until he finishes his meal. Repeat this each day, bending just a little bit each time. As you’re bending your hand is moving ever so slightly closer to the bowl. Keep doing this exercise slowly, until you are at the point where he is relaxed enough to allow you to give him a treat next to his food bowl for about a week. Once this happens, move on to the next step. 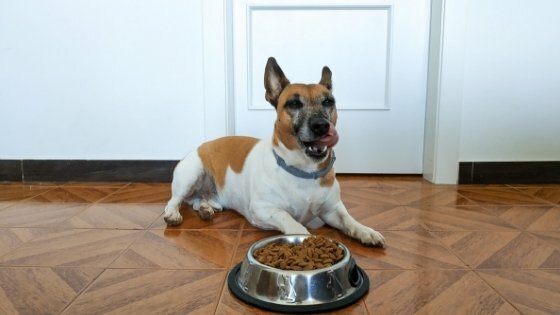 Now that you’re able to bend down near your dog’s bowl and give him a treat, the goal of this step is for you to touch his bowl with one hand, while giving him the treat with the other. As before, once the treat is given turn around, walk away and repeat several times. As always, remain at this step until you can touch his bowl during about a week of meals, while he is relaxed. Approaching him with your usual greeting, stand next to your dog, bend over to pick up the bowl and raise it just a few inches off the ground, drop a treat in it, put the bowl back down and walk away. Repeat. The same as step 6 but you’re raising the bowl higher off the ground to put the treat in, then putting it back down for your dog to eat. You want to be able to stand straight while holding his bowl. You are now able to reach down, pick your dog’s food bowl up and he’s okay with it. Now you’re going to walk over to the counter, put the treat in the bowl over there, then return the bowl to your dog and repeat. Everyone in the household has to go through steps 1-8, but do it one person at a time, not more than one person going through the steps at the same time. I think I hear you groaning! Understandable, it’s a very lengthy process and does require your time and effort at each feeding. It has so many steps for a reason. The best way to help is to make it as gradual a process as possible, changing your dog’s attitude from seeing you as a threat to his prized possession, to the giver of something wonderful whenever you’re near him at meal times. It’s not your dog’s fault he guards his resource, and as our dogs’ guardians it is our responsibility to do whatever we can to help and this is one of those times, and one of those ways!! Obviously I have no idea how aggressively your dog guards his food, but it’s best to take such baby steps so we help your dog very slowly adjust. If your dog is not that aggressive, or is really responding well, you could do each step for 6 day, or even 5 rather than 7. Remember, rushing training doesn’t benefit anyone. I know there’s a lot of information here, but it’s all broken up into very easy to follow baby steps. It may seem overwhelming at first, but take time to read each step to get a better understanding of what’s involved, then choose whichever plan you want to try first. If your dog is very aggressive, the second plan with 8 steps may be better, but it’s entirely up to you. 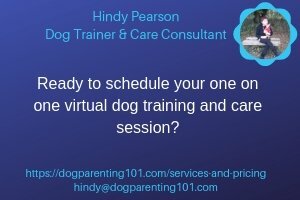 If you aren’t feeling very sure about tackling this on your own, or you aren’t seeing the results, find a qualified trainer or someone experienced in dog behaviour. I have an online pet consultancy service, so if you prefer to contact me for help through video call, I am certainly happy to do that.